July 11, 2010 March 31, 2016 admin 3432 Views 1 Comment Fat Momma, Fat Momma-Nell Wilson, Nell Wilson, Who wants to be a superhero? Skills and abilities: Trained guidance counselor. Powers: Nell has the ability to control her molecular structure. By increasing her density she can make herself heavy and immovable, grant superhuman strength. By lessening her density she can become light enough to float on air allowing her to fly. When angry she grows in height, weight and density allowing increased strength as a giantess. Empathy-Able to sense the emotional state of others. Nell was working as a high school child counselor and was pretty good at her job. One day after suspending some bullies who were picking on overweight kids, said kids stole her lunchbox and injected every chemical from the chemistry lab into one of her doughnuts. This doughnut when eaten gave her superhuman powers. 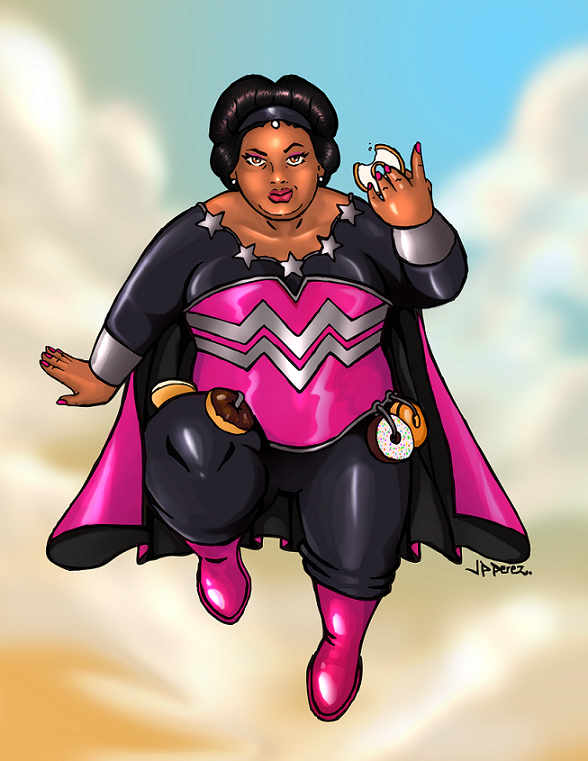 She now fights for the helpless as Fat Momma, ridding the world of bullies, one doughnut at a time! Thanks for including Fat Momma. I love Nell. Met her at Comic-Con right after her season of Who Wants To Be A Superhero ended. Love all the photos and illustrations you included. Almost all of them, I’ve never seen before.